The Pakistani hero (Ali Zafar) of E Nivas’s Total Siyapaa is named Aman, and he’s in love with an Indian named Asha (Yami Gautam). (Get it? She’s “Aman ki asha,” which is what this film was called at some point.) And they plan to confer on their daughter the admirably pacific name of Shanti. We don’t get to the point where the child’s sartorial choices are announced – say, a saffron-tinted salwar and a green kameez emblazoned with a star and the crescent moon – but we get the idea: we are all the same people, and we should be together, not apart. Early on, as Asha is taking Aman home to meet her family, she asks him if he’s bought gifts for everyone. He says yes and jokes, rather lamely, that one of the gifts is “ek chhota sa bomb,” and this is overheard by a cop. Aman is arrested, stripped, interrogated, and eventually released. There’s worse in store. 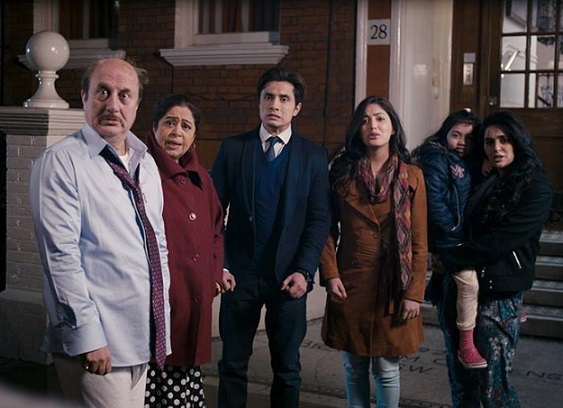 Asha’s family is horrified that she is marrying a Pakistani. By now, we are primed for a film that’s as much about the difficulty of us coexisting with our neighbours as it is about brown-skinned people coexisting with the white man. But the Indo-Pak angle, it turns out, was just a switch to get the film started. Aman could have been Adam, and the story would have been no different. Total Siyapaa is peopled with promising characters: a hysterical mother (Kirron Kher, reprising her Dostana character), a five-year-old who likes to strap pillows to her stomach and pretend she’s pregnant, a visually impaired grandfather who determines the gender of the person in front of him by copping a feel. But despite a few big laughs, the film never becomes the farce it so desperately wants to be. Nivas doesn’t drum up enough madcap momentum, and even at less than two hours, the happenings feel stretched. At the end, we’re left with – how do we put this? – ek chhota sa bomb. Copyright ©2014 Baradwaj Rangan. This article may not be reproduced in its entirety without permission. A link to this URL, instead, would be appreciated.